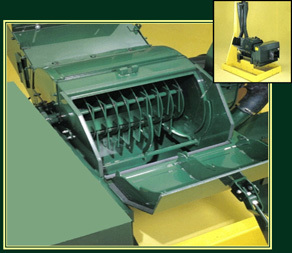 Art's-Way can offer the two main types of mill-mixer for feed preparation, both Hammermill and Rollermill mixers. Interest in the UK has mainly been in the high output Hammermill mixer. An Art's Way hammermill is unique, both in design and quality. The heat-treated hammers yield the even, integrated grind essential to producing top quality feed rations, and at lower maintenance costs, increasing the longevity of hammers and screen. Whether you choose an electric motor or PTO drive, the durability of this unit will keep your maintenance costs firmly in check. As with every Art's Way product, the hammermill is designed to put money back in your pocket. Each hammer can be turned four times, extending the machine's life and productivity. A strong magnet installed in the mill's grain entry throat also collects tramp metal for years of worry free operation.